I know that all of you Jacob fans out there are dying for info on the Breaking Dawn films, and luckily, news is finally starting to trickle in. The fourth book in the Twilight Saga, Breaking Dawn, will be split into two movies. The first film will open in theaters November 18, 2011. Part two is set for release November 16, 2012. Yeah, a whole year apart. The biggest casting news is of course who will play Renesmee, Jacob’s creepy love. 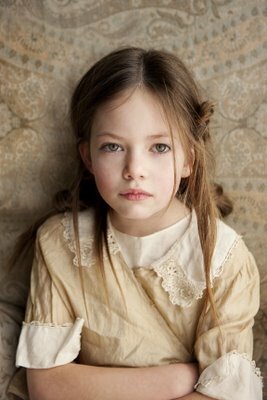 Nine-year-old actress Mackenzie Foy has reportedly been chosen to play Bella and Edward’s child, Renesmee Cullen. But this has yet to be confirmed! So don’t get too excited. EW says that the young actress is close to signing on for the role of Renesmee, although Summit Entertainment has yet to confirm this bit of casting news. Lame. But that’s not all the Renesmee news, if Mackenzie does land the role, she will be portraying a character that ages very very quickly. You may wonder how the film’s director will pull that off without making it look ridiculous. Well, sources claim that director Bill Condon will use similar digital effects to those used by David Fincher in The Curious Case of Benjamin Button. Which means that little Mackenzie’s face would be digitally transferred onto the face of a younger child. Hmm. One big question all fans have is what’s going on with the Breaking Dawn script. Ashley Greene joked, “I haven’t seen the script yet. I reckon it will come in a sealed secret box, with a tracking device.” Yeah, that’s not exactly informative is it? The first Breaking Dawn movie is currently filming in Baton Rouge, Louisiana. The second one is set to be filmed in Brazil, where sources say Bella and Edward will be exchanging their marital vows. So now you know where to get your stalk on.